We first met Rachel Mudge Veitch, age 78, registered parlimentarian, sorting through the T-shirts in the Old Farts Car Club tent. She wanted to buy a certain size, but we were down to the last shirt in that size and it had a stain on it. She mercilessly beat one of the OFCC members down on the price... ridiculous low. A member standing off to the side said I'll take the thing at that price! Rachel said, "no you won't, I haggled them down, and you're not going to get it"!. She was wearing a white silk 'Winston Cup' jacket and said she loved cars, and learned that she had come all the way down from Pittsburgh to visit the Daytona International Speedway. She wanted to be the first in line to have her picture taken in front of the Daytona Victory Lane sign. As you can see, she made it. 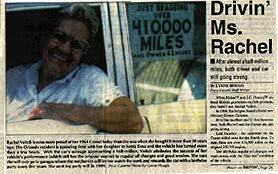 She began to tell the story of the Mercury Comet Caliente that she is sitting in. She calls it "LaChariot" and she has owned it since new. She said,"wait a minute, I've got something to show you, and she took off all the way across the speedway to her car to get her scrapbook. She returned a short time later. without missing a breath and began again the story of her "La Chariot". She bought it brand new for $3200. and has every piece of paper that ever had anything to do with "LaChariot". She had a picture of her and the car when they were both a little newer. She had newspaper articles about her car and her adventures, and she had documentation of about every thing ever done to the car since it was new! It now has 416,000 miles and is still going strong. and has photos of the engine during the repairs! She says she won't deal with a mechanic that won't let her watch. She now uses on one kind of oil and has had no problems with her engine since. We are in major negotiations for that oil company to sponsor Rachel on a trip along route 66. 14 J.C.Penney Batteries...with lifetime warranties. 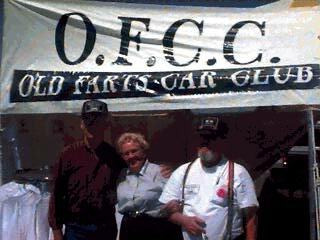 She is the very embodyment of the 'American Automotive Culture and Experience', and that is why she has been choosen as the poster girl of the Old Farts Car Club. When ever we get down or discouraged think about Rachel. The OFCC is trying to become her agent, but they figure they'll need money, guns, & lawyers... 'cause knowing Rachel they will be lucky to get 2%! That was the last we saw of Rachel! She was off to join in "the lap" of the speedway, held each year! 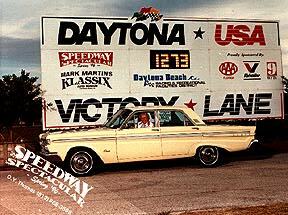 She wanted to experience the thrill of driving the big oval at Daytona International Speedway. at the wheel of her "LaChariot"